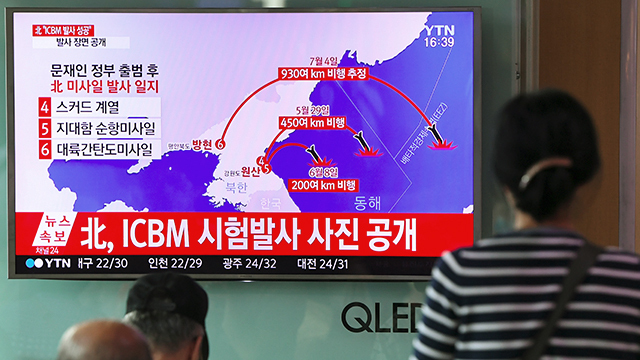 North Korea’s successful test of an intercontinental ballistic missile has prompted strong criticism from the United States and from governments across the Asia-Pacific region. But even before the test – which Washington and Seoul labeled “destabilizing and unlawful” – Americans and many people in the Asia-Pacific region held negative views of North Korea and its nuclear weapons program. Here are four new key findings from Pew Research Center about views of North Korea and its nuclear program, based on a survey conducted in the U.S. and six Asia-Pacific countries between February and May. 1 Many people in Asia-Pacific countries have negative views of North Korea. 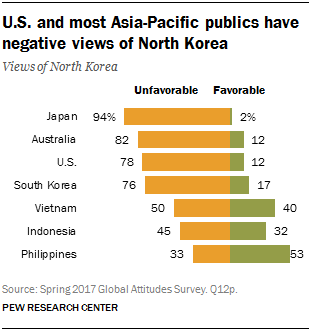 Among the countries surveyed, the Japanese are most negative on North Korea: 94% say they have an unfavorable view, including 78% who say they have a very unfavorable opinion. In Australia, the U.S. and South Korea, roughly three-quarters or more say they have unfavorable views. Across the region, only Filipinos have a generally positive view of North Korea, with more than half (53%) holding a favorable view. 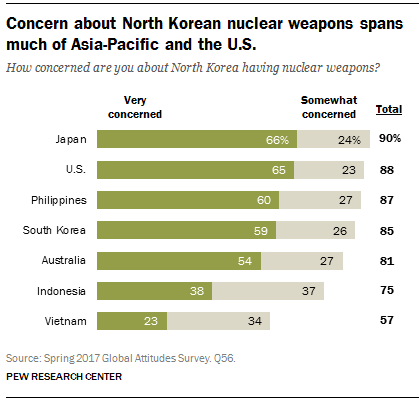 2 Americans and most people in the Asia-Pacific countries surveyed are concerned about North Korea’s nuclear program. Half or more in each country say they are somewhat or very concerned about the nuclear program. In the Asia-Pacific region, anxiety is highest among Pyongyang’s closest neighbors – Japan, the Philippines and South Korea, where around 60% or more say they are very concerned. 3 People in the region are divided about whether increasing economic sanctions or deepening ties is the better response to North Korea’s nuclear program. Although people in the Asia-Pacific countries surveyed are largely united in their concerns about the nuclear program, there is no clear consensus about how best to deal with the issue. Among the more economically developed countries, the preference is for increasing economic sanctions. Half or more Americans, Japanese, South Koreans and Australians believe increasing sanctions will be more effective than deepening ties. But opinion is more divided in the developing countries in the region. 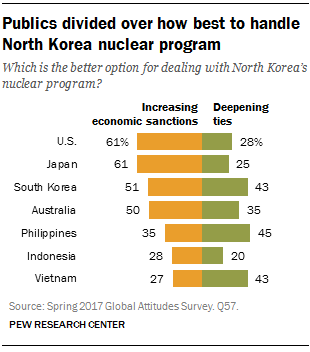 A plurality of Vietnamese and Filipinos say the nuclear problem should be handled by deepening ties with North Korea, and in Indonesia, large shares volunteered that neither was a good strategy (18%) or said they did not know (23%). 4 Japanese and South Koreans expect the U.S. to come to their aid in the event of a conflict with North Korea – and Americans support such a move. Two close neighbors of North Korea, Japan and South Korea, are also U.S. treaty allies, meaning that if North Korea used military force against them, the U.S. would be obligated to defend them. In both countries, large majorities expect this would happen: 91% of South Koreans expect U.S. assistance in the event of a military conflict with North Korea, and 82% of Japanese say the same. 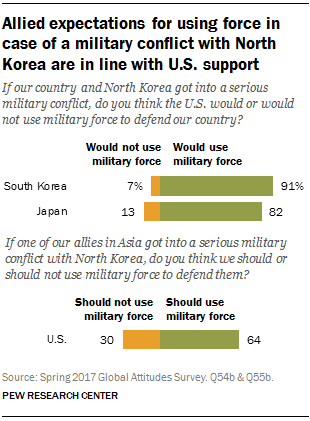 Nearly two-thirds of Americans (64%) say the U.S. should use military force to defend its allies in Asia in the event that they get into a serious military conflict with North Korea.